The life science and healthcare industry must work with technology companies such as Apple and Google to make a concerted effort and truly move beyond the pill - or risk failing patients. 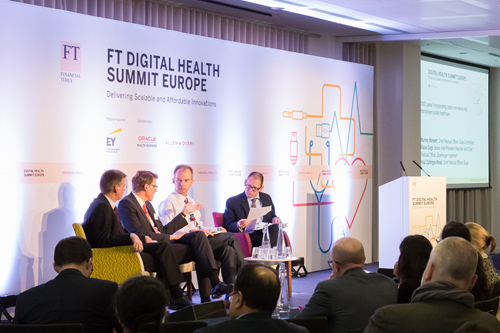 This is according to leading industry heads speaking at this week's Financial Times digital healthcare event in London. But he said that in order to move beyond the pill, pharma would “have to work together with the Googles and Apples of this world; it has to be a partnership”. This echoes the belief of Jane Griffiths, company group chairman responsible for Europe, the Middle East and Africa (EMEA) at Janssen, who added that “nobody can do this on their own – there needs to be an acceptance that existing businesses need to be involved in digital health development”, and said she welcomed the advent of Apple, Google and Samsung moving into health. Pharma-tech relationships are already happening, with Novartis recently buying the rights to Google's 'smart lens' technology to help diabetes patients control their sugar levels, and just last month the Swiss firm also announced it was co-funding Rani Therapeutics - alongside Google - to help develop a new 'robotic pill'. 23andMe, the US-based genetic and diagnosis home testing kit company has also signed multiple deals with big pharma firms, including Pfizer and Roche/Genentech, to help understand certain therapy areas better using big data analytics. But while some individual companies have teamed up with the tech industry, pharma and healthcare in general have both been slow to adopt new technologies in the digital space - a point made repeatedly throughout the conference. A number of industry heads contended that the reason was not a lack of enthusiasm for digital health, but rather because “science is complex”, therefore requires time to link what happens in the lab and the boardroom into a social media strategy, or into the clinical trial space. But the consensus was that working with the likes of Google and Apple will only help accelerate this process. Data transparency was also a key issue at the event. Dugi said that BI “wants to be transparent, but it is absolutely essential that we have data protection” - i.e., not allow pharma's intellectual property to be made public, or contravene a patient's privacy. She said that the advent of big data - with consent - was important, as “digital technology can help with screening drugs, screening patients for clinical trials and shortening development times”. Griffiths also touched upon the ability of digital to help with affordability, saying that system had to be in place that allow real world monitoring of evidence and patient support systems, “to ensure payers get the best value from drugs”. On the regulatory side Peteris Silgalvis, head of unit for eHealth and wellbeing in DG Communications Networks, Content and Technology (CNECT) at the European Commission, said that privacy and security “were issues arising from [a recent EC consultation on mobile health] in particular, and said that health data were now “being looked at by European Parliament”. Zilgavis admitted that “most health apps [for smartphones and tablets] will end up unregulated in Europe,” although he added that there “may be some guidelines”. This is in contrast to the big debates in the US about app and device regulation, which is still ongoing.